There are many people in our communities that help us in many different ways. Kids see them all the time and don’t necessarily know what they are called or what they do. 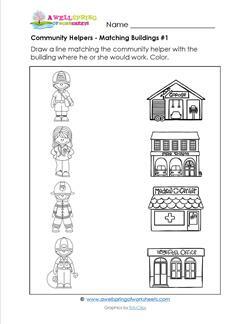 This community helpers section will help you solve that problem! The 24 adorable characters in these pages provide opportunities for kids to think and talk about jobs. Example jobs include teacher, lifeguard, doctor, mechanic, farmer, and vet. Using these resources, your kids will be able to match people to the places where they work and the vehicles they drive, play I Have Who Has, match puzzle pieces, read and recognize vocabulary cards, use flash cards, and much more! Over 60 pages of resources that are too much fun!